Sunny Beach is the biggest of all the seaside resorts on the Bulgarian Black Sea Coast. It is also the liveliest, and the one that British and Irish tourists love most. There is a Blue Flag beach with soft sand, lots of things to do and places to eat and drink, so Sunny Beach is great for sun-lovers of all ages. The resort is perched at 36 km north of Bourgas and about 90 km to the south of Varna . It is naturally set in a small bay, protected by the slopes of the Balkan Mountain to the north. Its long beaches reach as far as Nessebur to the south and St.Vlass to the north. From 2003 there is located Action aquapark that offers a lot of water attractions for each taste and age. 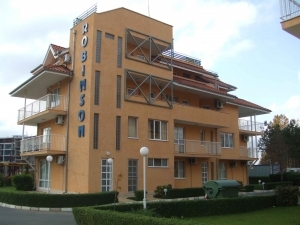 Robinson is a lovely small complex of 2 buildings on four floors in a quiet area of Sunny Beach on Bulgaria's Black Sea Coast. The complex is located 300 m from the sea coast and 400 m from the center of Sunny beach. The complex is built in 2004 and has an authorization for use (App. 16). The apartment for sale is situated on the third floor. It comprises a bedroom, s living room with dinning room and a kitchenette, a bathroom and a big terrace. The dwelling extends to 85.98 sq. m including 8.639 % common parts of building. There is a garden in the complex, also parkplaces. There is 24-hours security. All apartment are for personal needs, there isn’t rents. In the complex there isn’t restaurants, cafes and bars, and gives you the peace, tranquility and security. The swimming pool has a part for children with slide. The apartment is for sale completely furnished with air conditioner and cable TV.